Guess Who I Spent Last Week With? Last week I attended the Munsell Centennial Symposium with over 180 people from 27 countries representing color disciplines across science, industry and art. We gathered in Boston under the umbrella of the ISCC (Inter-Society Color Council) and AIC (International Colour Association) organizations with the intent of bridging our passions, knowledge and experiences in the field of color. It was an inspiring week of lectures, workshops and conversations, all the while meeting delightful and dedicated people. 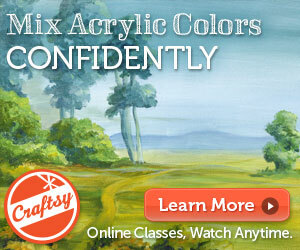 I never knew so many professions existed solely for the purpose of better understanding and using color! I found myself feeling a bit like a kid in a candy store. 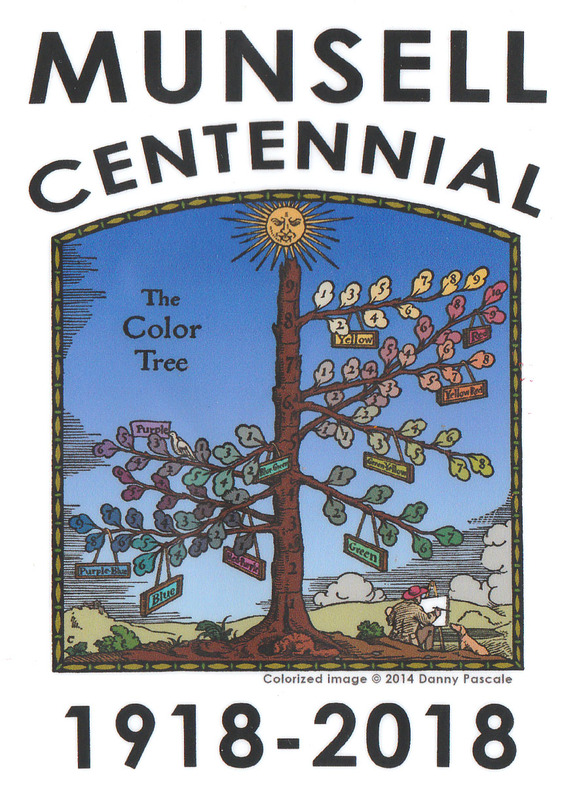 The centennial celebration was in recognition of Albert Munsell’s (1858-1918) significant contributions to our world of color. Though he was not alone in the pursuit of creating order out of the chaos of color back in the early 1900’s, he developed a color system that is widely used today. He is responsible for the Munsell Color Tree that visually displays, hue, value and chroma. This is refernced in my recent blog, What are the Three Characteristics of Every Color? I met color consultants, authors, color scientists and researchers, historians, professors, artists, librarians and a visual neurologist who are committed to spreading the word about color. We were housed in the Massachusetts School of Art & Design. It was fascinating to learn that my suite mate is a color technician working for PPG (Pittsburgh Paints Group), whose sole focus is on the color mixtures in the paints and coatings for anything on wheels. Two of her top customers are Polaris and Harley Davidson. Could I use any of her shiny motorcycle paints in my paintings? Why did I attend? 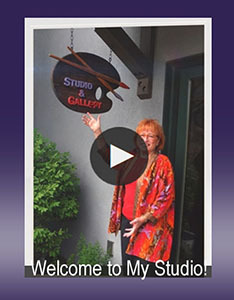 I wanted to see where my forthcoming book I Just Want to Paint! fit in the larger scheme of things. Did it have a place? What information might I learn to add or delete from it? I was pleasantly surprised to learn that my content does not need to be altered for my readers, and that it will continue to hold its unique niche in the color mixing arena. This validation is comforting and motivating. Color literacy was a topic that was often discussed. Hmmm, I had never thought of that as being a challenge. However, I soon learned that it is a problem across disciplines and cultures. I was also introduced to new vocabulary, such as: color space, color notations, perceptual aspects of color ordering, and colorimetry. By the way, do you know what a colorimeter is or a spectrophotometer? And that many industries – textiles, automotive, plastics, paints, decorators, forensic scientists, soil scientists, etc. – rely on the ability to measure color to create their products and services? Wow, my world has been expanded! Johannes Itten was the first to promote the three primary system of yellow, blue and red. Today, the phrase ‘color theory’ is not well liked across all disciplines because it is difficult to define and it does not attract people to want to learn more about color. Joy Turner Luke, a 93-year old artist and teacher, talked about how she was instrumental in persuading paint manufacturers to adhere to safety standards for art materials. This was and is, for the protection of children and adults. In 1988, the ASTM D4236 Federal law was passed and began appearing on art material labels. Her book is “Munsell’s Vision for Teaching Artists,” which explains how she used the Munsell Color System to paint her paintings. There are 3-primary, 4-primary and 5-primary color wheels. Color memory can bias or influence color perception. 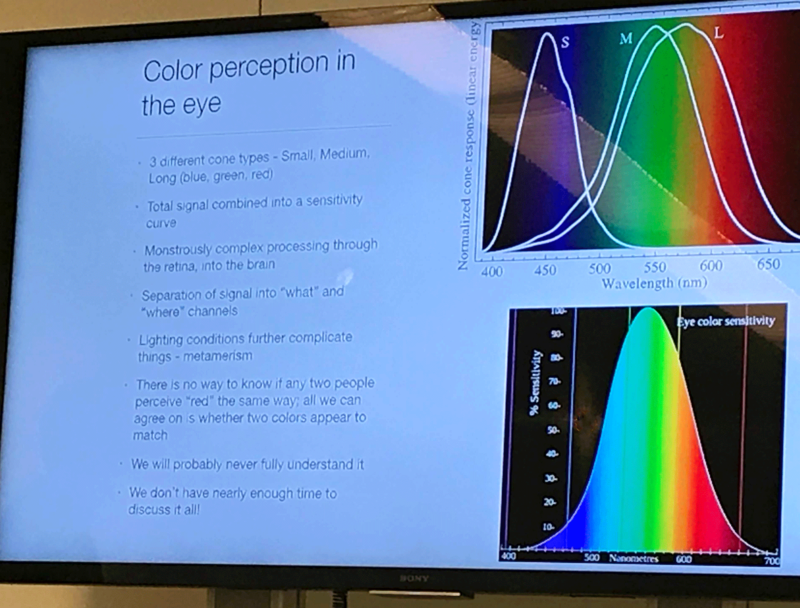 One professor explained – or rather attempted to explain – the differences between, brightness, lightness, colorfulness, saturation, chroma and brilliance. Supposedly this knowledge can impact one’s painting ability, but I got lost in the weeds of too many words. I would rather paint, lol! And, there were several lectures that included slides like this one, which were intriguing but I did not fully understand their meaning. Some of color research being conducted today is interesting. 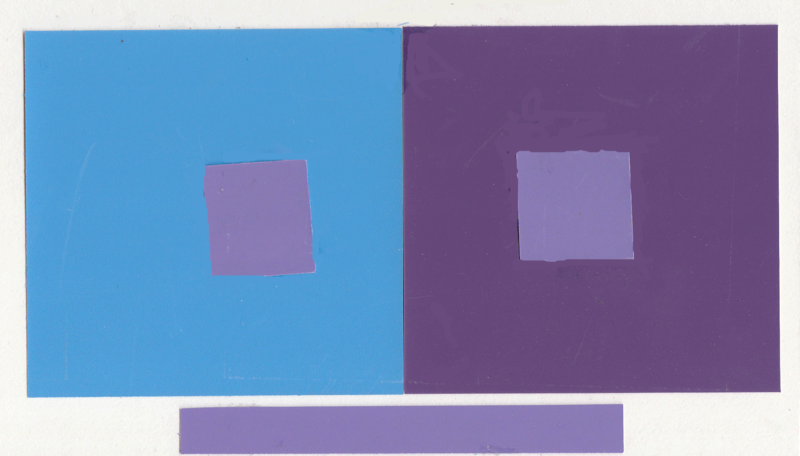 In the two half-day workshops I attended, I was re-introduced to Josef Albers and his teachings of how color – hue, value and chroma – can be manipulated to create illusions. He instructed art students to explore the similarities and differences in color when influenced by a surrounding color. It’s human nature to look for differences. Below is an example I created during the workshop. I had to choose from 200+ paper samples to show how the same color can look quite different on two different backgrounds. I cut out these papers to solve the problem. What are the implications in painting? This phenomenon is called simultaneous contrast. In the second workshop, two established painters explained and demonstrated their strategy for matching colors using the Munsell Color System. I was thrilled when they stated the uselessness of referring to hues as ‘warm’ and ‘cool’ when mixing color. I have written about this in my forthcoming book “I Just Want to Paint: Mixing the Colors You Want!” in Chapter Three: How to Identify the Color Bias of Primary Colors. The most compelling talk, “What Art Can Tell Us About the Brain,” was presented by Dr. Margaret Livingstone, a visual neurologist and probably one of the most intelligent people I have ever encountered. Throughout my painting career, I have often heard or read the statement, “Values are more important than color.” Dr. Livingstone proved how we see whites, grays and blacks before we see color. As a result, values are have a greater impact on the viewer than color. I highly recommend watching her YouTube video; this video takes place in a different venue, but the content is the same. She uses paintings, in particular the Mona Lisa, to demonstrate her findings. The conference ended on a special note for me. At the dorm curb, a fellow attendee spontaneously asked to join me in a taxi to the Boston airport. She is a color research scientist at the Rochester Institute of Technology (RIT). As we rode along, I told her that I was interested in exploring how a collaboration could potentially happen between a scientist and a studio artist. She then preceded to tell me about the research she has done on how humans look at paintings. RIT have an eye tracking device that maps where novices versus trained professionals look at paintings of 5 different styles. What?!! I am fascinated. She even suggested that they may be able to do this with a few of my paintings. How cool would that be? Then I started to discuss how painters critique each other’s work, yet, I wonder, is that valuable given that novices look at paintings differently? Needless to say, it was a memorable week. I will continue to process my experiences while looking forward to continuing to foster the relationships that began in Boston. I am very grateful that I was able to attend this special conference, because I see from a different lens. Please share this blog using the social media buttons below. PS You may be asking: How did I know about the symposium? I knew about it because the Munsell Foundation had discovered my blog a few years ago and had asked me to write two guest blog posts. I remained on their mailing list. Hence, I received the notification. Despite it being a financial stretch, I knew I had to attend. I am very glad that I did. How often have you walked into a room or museum and been overwhelmed by the creativity of one person? This past April I had the wonderous opportunity to spend nearly 3 hours in the Vincent Van Gogh Museum in Amsterdam. It had been suggested that I go before we left for the Netherlands, but no one had raved about it. And I admit, when I first saw the building I was not enticed because the architecture didn’t convey Vincent Van Gogh — in my humble opinion. Carrying this bit of indifference and perhaps lower expectations into the museum probably helped to set the stage for the swing of emotions and thoughts that surfaced once I stepped inside. Being surrounded by his genius was jaw dropping. I wish I could offer a photo of the interior. I was too in awe to think of taking one and then was told that photography was not allowed anyway. Did you know that he painted 29 self-portraits? I would love to know where the motivation for this came from and what he gleaned by painting them. How many self-portraits have you painted? 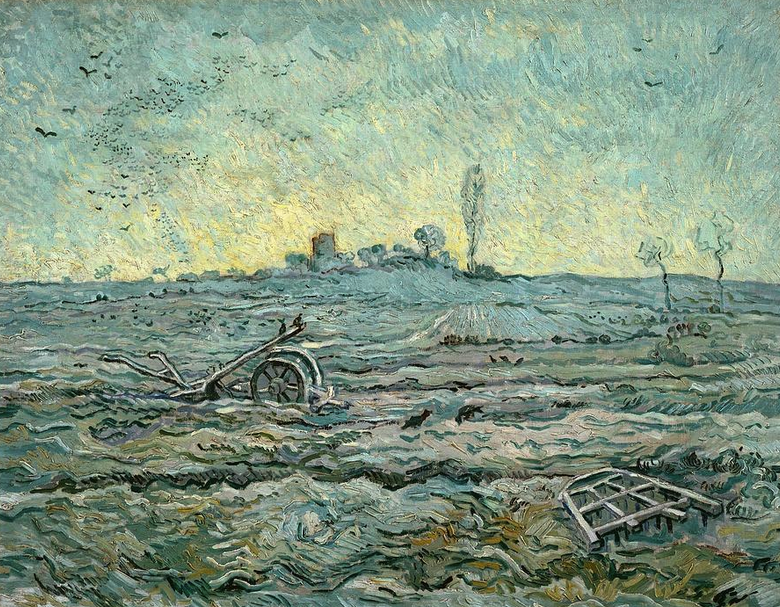 I confess, that I have never done one though I have an inkling that Van Gogh just might nudge me to do one. 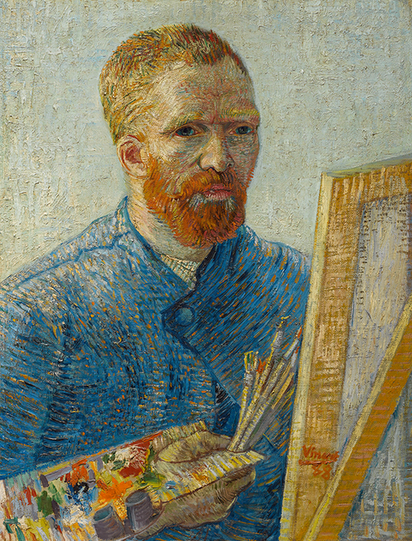 Wouldn’t it be interesting to see all of his self-portraits in a single exhibition and in chronological order? 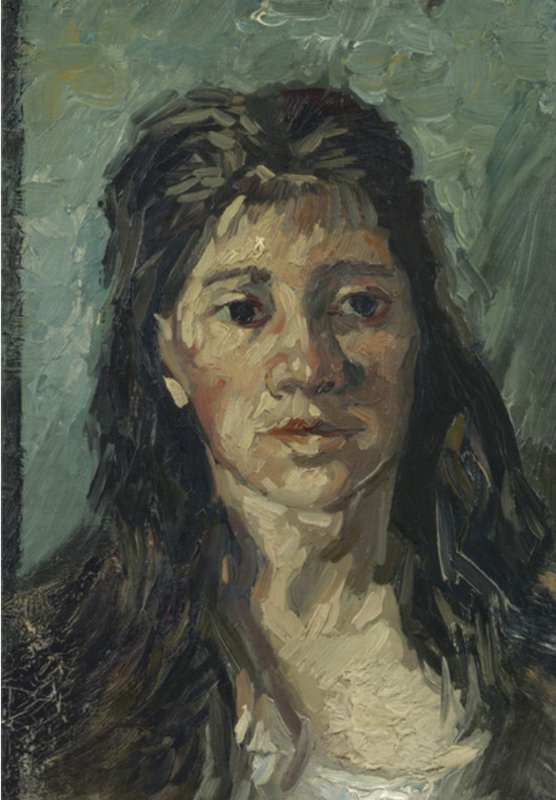 The contrast between his self-portrait as a painter above and the portrait “A Head of a Prostitute,” below is fascinating. The brush strokes are alive in both, yet very different. It is interesting to compare the use of intense colors in one, while using muted colors in another. Apparently, he energetically experimented with his tools and colors. Oh, how I would love to have a video of him applying paint and observing the sequence of layers. Wouldn’t you? Walking around the museum was mind boggling and inspiring. I selfishly wanted everyone else to go away (hundreds of people go through this museum daily) so that I could just sit quietly and take it all in. I imagined meditating in the various rooms….meanwhile wishing to soak up some of his spirit, vision and talent. He wrote over 850 letters, painted 74 paintings during the last 78 days of his life and who knows how many total paintings he created all the while not selling one of them in his life time. 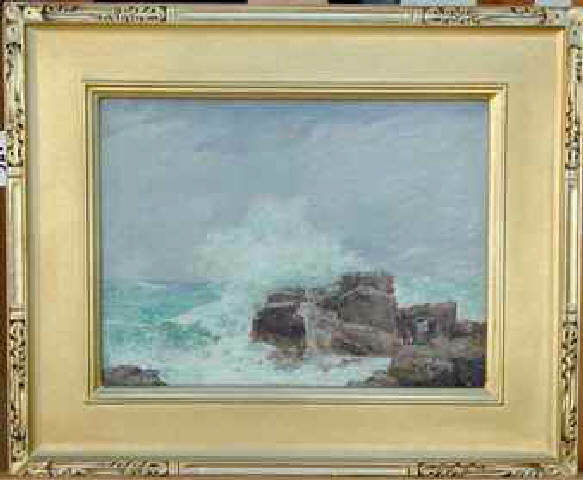 And he only painted for 12 years, while battling emotional upheavals. Can you wrap your head around these accomplishments? I know I can’t. We are fortunate that his brother Theo knew and believed in Vincent to the point that he financially supported him the best he could. (What does it say about Theo that he kept all of the letters?) Then I learned that it was Theo’s wife, Johanna van Gogh-Bonger who promoted Vincent’s work after both Vincent and Theo were deceased! (BTW, Theo died 6 months after Vincent’s death.) She was dedicated to establishing his recognition. In 1914, she published the letters between the two brothers. We have her to be grateful for the opportunity to know and enjoy Vincent Van Gogh’s work. A great woman was behind a great artist. Because of his seemingly intuitive brush strokes, I sense that many painters believe that his use of color was also intuitive. I learned in a previous exhibition of his work, and it is was evident in the Van Gogh Museuem, that he was an ardent student of color. He was aware of how color impacted mood and vibrancy, and how it carried his visual message. Notice the mood he conveys in this nearly monochromatic scene. It is very cool, yet he sparsely includes the warm oranges in the foreground, while having applied an under painting of cool (green) yellows in the far background. Complex, yet simple. This only comes from study and practice. When you imagine sunflowers in a painting, don’t you immediately think the artist would paint the flowers with bright saturated yellows and oranges? 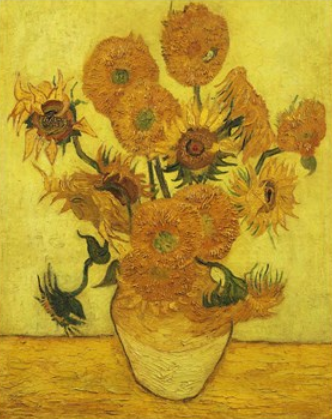 Van Gogh did do this in other sunflower paintings, but in the one below, the saturated colors are in the vase and background behind the de-saturated sunflowers. What is your reaction to this painting? Would you consider using this strategy in your next floral painting? 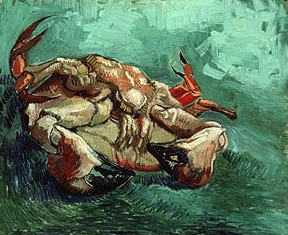 This next painting “A Crab on its Back,” shows how he used the complementary colors of green and red. I also like it because there is such a variety of brush strokes from foreground to background. The energy these strokes give to the subject is also captivating. Scroll back up the portrait of the your woman and compare how he used the same color scheme yet mixed the reads and greens and applied them quite differently. 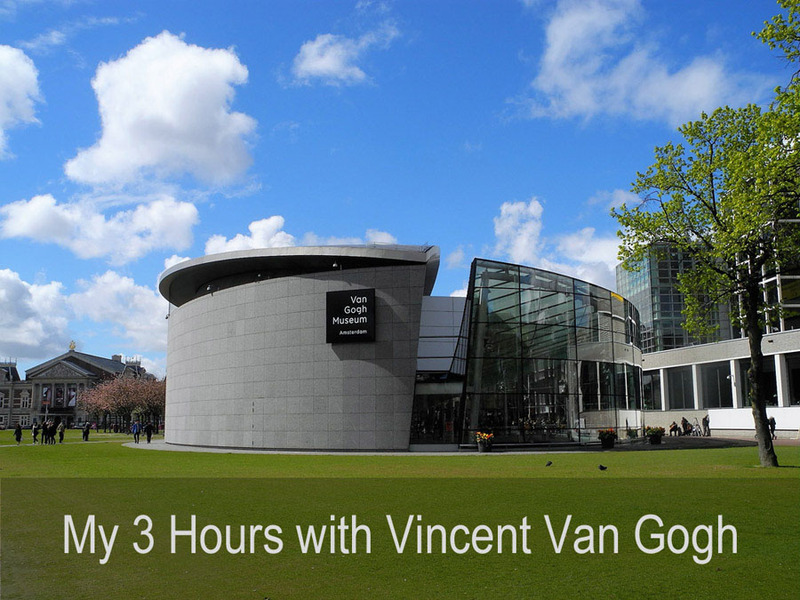 Visiting the Vincent Van Gogh Museum was a surprise highlight of our time in the Netherlands. I left wanting more. Experiencing that kind of commitment is compelling, subsequently inspiring. The short time I had will be treasured. What exhibit or museum has inspired you? Initially, my main motivation for going to the Netherlands was to experience the famous tulip gardens. They too were beyond comprehension…..the colors were glorious. For more on our trip to Amsterdam and Iceland, visit: Amsterdam vs Iceland – A Visual Contrast. If you enjoyed this post, please share it. Thank you. Who was Albert Munsell? How does he impact your world? Did you know that he is the founder of the common color theory principles taught today? 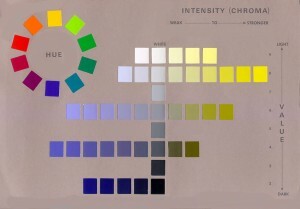 Munsell’s Color System. Click to enlarge. P rofessor Albert Munsell (1858-1918 Boston), was an artist of distinction and a gifted teacher of art. 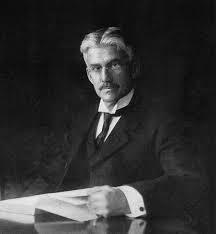 He developed the first widely-used color system to make the description of color accurate and convenient. 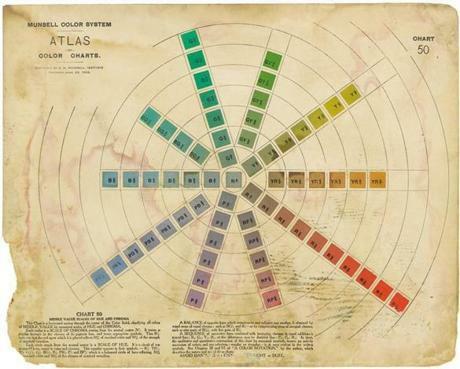 Munsell created his system to facilitate the teaching of color. The Munsell color system (originally called the Munsell Color Order System) is accepted throughout the world and has served as the foundation for other color systems/theories. Below is an example of one of his paintings. In 1917, Albert Munsell founded the Munsell Color Company. Later, in 1942, the Munsell Color Foundation was formed by the company to promote the advancement of the science of color. Ultimately, the Munsell Color Foundation led to the founding of this laboratory, the Munsell Color Science Laboratory, in 1983, at the Rochester Institute of Technology.The latter still exists today. 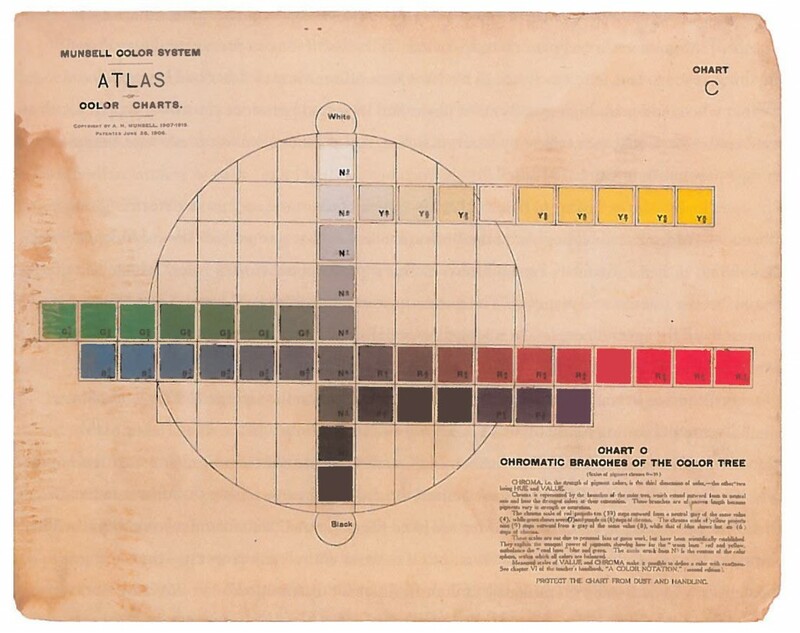 These are sample pages from Munsell’s book, the Atlas of Munsell Color System (1915). The way you visually match color today is the result of Albert Munsell’s work of nearly a hundred years ago. For years, scientists had studied the mechanics of color going as far back as Newton’s early color wheel. 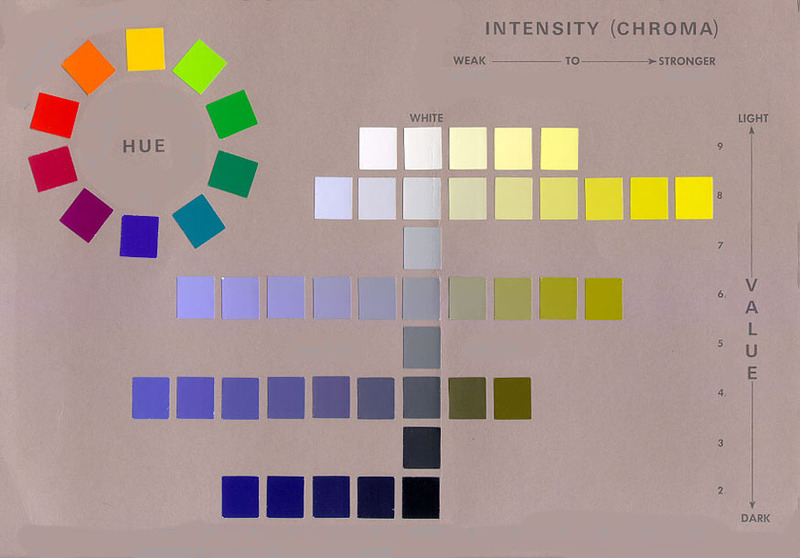 It was not until Munsell’s pioneering studies and teaching methods had anyone combined the art and science of color into a single color theory. His groundbreaking work laid the foundation for today’s understanding of color principles. Imagine being a painter and not knowing and understanding the basic color vocabulary of: values, chroma (intensity) and hue? He gave us a language from which we benefit as each of us learns more about the complexities of color in our paintings. His descriptions of hue, value, and chroma gave us the three dimensional view of color. An artist and an educator, Munsell developed his color theory to bring clarity in understanding color through an orderly system. One of his goals was to assist in accurately identifying every color that exists. Munsell based his system on what he defined as “perceived equidistance” — the human visual system’s perception of color. (Isn’t that a mouthful and something you rarely hear come out of an art teachers mouth?) He also wrote A Color Notation in 1905. Professor Munsell stated, “Music is equipped with a system by which it defines each sound in terms of its pitch, intensity, and duration, without dragging in loose allusions to the endlessly varying sounds of nature. So should color be supplied with an appropriate system, based on the hue, value, and chroma of our sensations, and not attempting to describe them by the indefinite and varying colors of natural objects.” It would have been fascinating to speak with him now wouldn’t it? 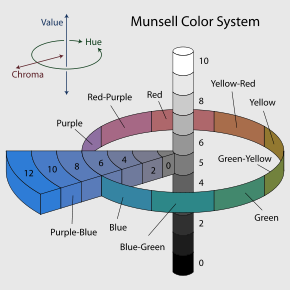 Do you find Munsell’s color system easy or difficult to comprehend? Are you grateful for his contributions? Munsell not only impacted the art world, he and his company have continued to influence all of us through continued study of color and offering products to assist artists as well as the digital world. If you find this information helpful, please share it with others.